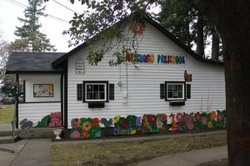 A co-operative preschool in the heart of rural Metchosin. Metchosin Preschool strives to provide a supportive, nurturing and family centred environment for children and their families. This will be achieved by providing a high quality preschool experience, parent support and education at the lowest possible cost. It is our belief at Metchosin Preschool that children learn through play. Activities are included which promote the complete development of the child – socially, emotionally, intellectually and physically – which encourage a good self concept, self control and self reliance. Children enjoy excursions into the community as well as indoor and outdoor play, both active and quiet, with the opportunity to use a wide range of materials and equipment. Limited numbers, as well as parent assistance in the classroom, make possible a great variety of activities and individual attention. Provision is made for individual differences and varying rates of growth and development; every opportunity is given to develop maximum self expression.